Update: I am now living the dream as a Software Engineer at Google in Pittsburgh. I work on Google Shopping. I completed my thesis in the Machine Learning Department at CMU's School of Computer Science. My advisors were Christos Faloutsos and Alan Montgomery. My thesis research was on finding patterns of network formation, evolution, and diffusion in real networks and applying these patterns to anomaly detection and consumer product reviews. While at CMU I also engaged in various stunts, such as participating in fake protests and fake conferences. I graduated from the University of Tulsa with Bachelor's degrees in Computer Science and Mathematics. I worked on AI research in Sandip Sen's lab, and also did research in applied math with Christian Constanda. M. McGlohon, N. Glance, and Z. Reiter. Star Quality: Aggregating Reviews to Rank Products and Merchants. AAAI International Conference on Weblogs and Social Media (ICWSM10). Washington DC, May 2010. [pdf]. L. Akoglu, M, McGlohon, C. Faloutsos. OddBall: Spotting Anomalies in Weighted Graphs. Pacific-Asia Conference on Knowledge Discovery and Data Mining (PAKDD10) Hyderabad, India, June 2010. Winner of Best Research Paper Award. [pdf]. M. McGlohon, J. Leskovec, C. Faloutsos, N. Glance, and M. Hurst. Finding patterns in blog shapes and blog evolution. International Conference on Weblogs and Social Media. Boulder, Colo., March 2007. [pdf] Tech Report (identical): CMU-ML-07-100. McGlohon, M. and S. Sen. Learning to cooperate in multi-agent systems by combining Q- learning and evolutionary strategy. World Conference on Lateral Computing, December 2004. [pdf] Best Student Paper Award. Feel free to re-use parts of these presentations. My policies for re-using them are 1) please credit me, and 2) don't change my fonts to Comic Sans. (new, under construction) Cascades code. Code for working with the structures of conversations in online social media. I have compiled data from the U.S. Federal Election Commission, representing federal electoral campaign donations from individuals to committees and committees to candidates. A description, and the files, are located here. In reverse chronological order. * indicates core MLD PhD curriculum. I have also enjoyed some stunts that were tangentially-related to my research. 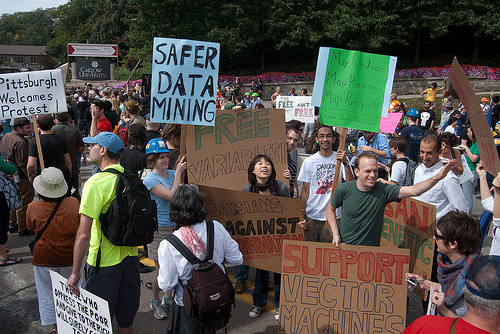 I was part of the Machine Learning Protesters, who appeared during the G20 People's March, in September 2009. That is me in the blue data mining helmet. For the complete set of photos see this Flicker Set. I have been on the SIGBOVIK PC since 2007. It is a "fake" conference, in that it contains research that is meant to be humorous or whimsical rather than technically rigorous. But it is not fake in that it does take submissions (via EasyChair), is peer-reviewed (albeit with a high acceptance rate), and has real presentations and proceedings. Here are my contributions to this conference. M. McGlohon. 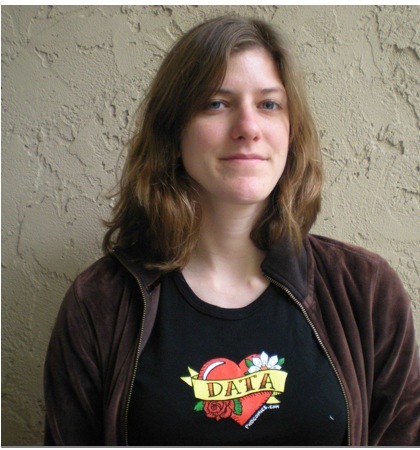 MapReuse and MapRecycle: Two More Frameworks for Eco-Friendly Data Processing. SIGBOVIK Pittsburgh, Penn., April 2009. Paper: [pdf] "Bypassing the Filters" Award for Paper Most Likely to be Cited by a Real Paper. Which means you should cite it. I enjoy puzzles. I once spent 36 straight hours (Saturday morning through Sunday afternoon) on a puzzle scavenger hunt while at Microsoft, one of the few grad interns nuts enough to participate. I maintained the departmental Coke machine. Diet Dr. Pepper is the most popular pop in the Gates-Hillman Center. I drove with Austin from Pittsburgh to Seattle, a journey of 2500 miles, and back, in summer 2008. It took 3.5 days to get there (a little longer to get back, as we made a stop or so). 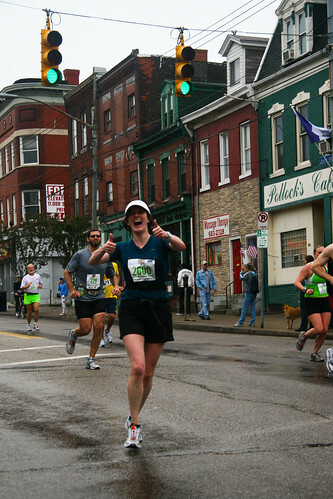 I ran the 2009 Pittsburgh marathon, with a lightning-fast time of 4:17:27. Nels, who took this photo at mile 23, says I was the happiest runner he saw. I can do a back handspring on an appropriately soft surface. I make some mean fried okra, a traditional Oklahoman dish.